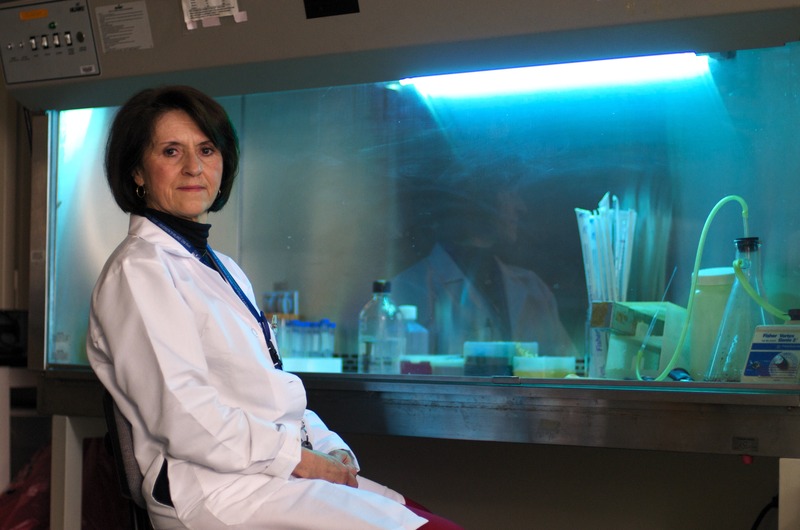 Manuela Martins-Green is a professor of cell biology at UC Riverside. Photo credit: UCR Strategic Communications. RIVERSIDE, Calif. – Researchers at the University of California, Riverside have identified components in pomegranate juice that both inhibit the movement of cancer cells and weaken their attraction to a chemical signal that promotes the metastasis of prostate cancer to the bone. The research could lead to new therapies for preventing cancer metastasis. Performed in the lab of Manuela Martins-Green, a professor of cell biology, the research was presented today (Dec. 12, 2010) at the 50th annual meeting of the American Society for Cell Biology taking place in Philadelphia. Prostate cancer is the second-leading cause of cancer-related deaths in men in the United States. To date, there is no cure for it. If prostate cancer recurs after treatments of surgery and/or radiation, usually the next treatment is the suppression of the male hormone testosterone, which inhibits the growth of the cancer cells because they need this hormone to grow. But over time, the cancer develops ways to resist hormone suppression therapies, becomes very aggressive, and metastasizes to the bone marrow, lungs, and lymph nodes, usually resulting in the patient’s death. The Martins-Green lab applied pomegranate juice on laboratory-cultured prostate cancer cells that were resistant to testosterone (the more resistant a cancer cell is to testosterone, the more prone it is to metastasizing). The researchers – Martins-Green, graduate student Lei Wang and undergraduate students Andre Alcon and Jeffrey Ho – found that the pomegranate juice-treated tumor cells that had not died with the treatment showed increased cell adhesion (meaning fewer cells breaking away) and decreased cell migration. Next, the researchers identified the following active groups of ingredients in pomegranate juice that had a molecular impact on cell adhesion and migration in metastatic prostate cancer cells: phenylpropanoids, hydrobenzoic acids, flavones and conjugated fatty acids. Martins-Green explained that an important protein produced in the bone marrow causes the cancer cells to move to the bone where they can then form new tumors. “We show that pomegranate juice markedly inhibits the function of this protein, and thus this juice has the potential of preventing metastasis of the prostate cancer cells to the bone,” Martins-Green said. Next, her lab plans to do additional tests in an in vivo model for prostate cancer metastasis to determine whether the same cancer-inhibiting components that work in cultured cells can prevent metastasis without side effects.